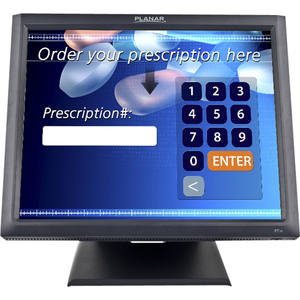 The cost-effective Planar PT1945R 19" Touchscreen LCD Monitor is perfect for use in retail, point-of-sale, healthcare and kiosk applications. Easily integrated with a variety of POS, thin client or PC systems, the touch LCD features 5-wire resistive touch screen with dual RS-232/USB touch screen interface, an internal power supply, speakers and a designed for touch enclosure. No drivers are needed for basic touchscreen operation, but for advanced features, drivers are quickly loaded using the easy to follow, step-by-step instructions. Product Description: Planar PT1945R, LCD display, TFT, 19"